Material feminism is producing new knowledge about humans’ engagement with the natural and physical world, the agentic nature of matter and the sociocultural context, and the entanglement of the material, such as bodies and learning spaces and time. 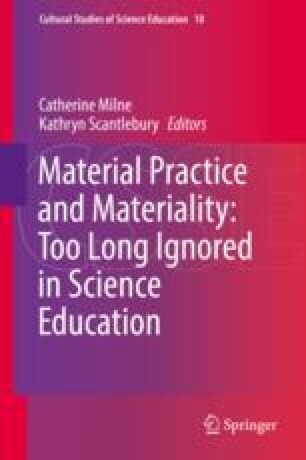 This chapter utilizes Barad’s concept of spacetimemattering to reintroduce matter/materiality into science education. Spacetimemattering are forces in producing material-cultural worlds through the intra-actions between human and nonhuman (matter) that also recognizes that time is entangled with space and matter (Barad K: Meeting the universe halfway: quantum physics and the entanglement of matter and meaning. Duke University Press, Durham, NC, 2007). By “cutting together-apart” a preservice teacher’s material moments in science, we will discuss how the enfolding of spacetimemattering provides opportunities for the production of new material-discursive practices that may generate positive responses from students to science experiences.